Mykolaiv international airport municipal enterprise on September 1, 2014 received the certificate of an airfield and the right to accept and service aircraft. The press service of Mykolaiv Regional Administration has reported that the enterprise, using its own resources partially restored and prepared special machinery for the winter period, the state of the emergency and rescue service was brought to the requirements, and the certificate for this has been received. In addition, on September 18, 2014, two planes performed flights to Uzhgorod from Mykolaiv airport, and for October an application for the acceptance of Airbus 310 aircraft has been received. "Today we could say that the airport has started restoring buildings and facilities, a customs and border checkpoint has been prepared. Relations with airlines with which the airport earlier cooperated are being restored. Last year, for the first time in 12 months the airport's employees received a subsistence allowance," reads the report, citing the new acting director general of the airport Oleksiy Melashych. 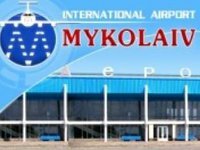 Mykolaiv Regional Administration said that in August 2014 the regional authorities decided to revive the airport, and on August 14, 2014, Chairman of the Administration Vadym Merikov signed a resolution appointing Melashych Head of Mykolaiv International Airport. Mykolaiv international airport has a runway 2,555 meters long and 44 meters wide. The airfield is able to accept aircraft of the An-22, Il-62, Il-76 (with restrictions), Tu-154, Tu-134 and Yak-42 types 24 hours a day. The airport has a passenger terminal with a capacity of 300 persons per hour.